Maybe the biggest benefit of the Web is the fact that conversations are happening everywhere about almost any topic. The eMINTS community is no different. We have many opportunities for conversation within our many web-based outlets. This blog is one of those outlets. Commenting or submitting your own blog posts makes Networked Teaching & Learning a perfect location for finding new ideas and resources as well as interacting with others in the eMINTS community. Even if you don’t submit a post or comment, NT&L offers teachers a variety of teaching ideas, online resources, and updates from the eMINTS National Center. Like many of you, eMINTS has a presence on Facebook. Facebook has made it easier and easier to connect personally and professionally with various networks of people. eMINTS meets you there with a Facebook Page and Group. Both spaces keep you updated as well as allow you to connect to other educators in the eMINTS network. For those who prefer the professional connections of LinkedIn, eMINTS has you covered there as well. Join the eMINTS Group at LinkedIn as a way to make connections with like-minded educators in a completely professional network. Two other places to follow eMINTS-related discussions are on Twitter and Tumblr. My Twitter account mostly shares links from this blog, but I will occasionally engage conversations under #edtech and #edchat hashtags. If you’re a Tumblr user, be sure to follow the posts at the eMINTS Tumblr, primarily set up to share resources. Finally, I will beginning to host Google Hangouts in an attempt to find new and exciting web applications for classroom use. If you are interested in participating in these Hangouts, add me to your G+ circle and message me about inclusion in the Hangout. Even if the Hangout fills up (there’s a limit of nine participants), it’s an opportunity to chat with other eMINTS educators, possibly setting up your own Hangouts. Missouri eMINTS Certified Educators Updated on DESE Website: The Missouri Department of Elementary and Secondary Education (DESE) has updated the Education Technology portion of their website to include a tab about eMINTS Certified Educators. See: http://dese.mo.gov/divimprove/instrtech/100%20eMINTS-METS%20Classrooms/ Please note that the listings include individuals who received certification through the successful completion of an electronic portfolio as of December 2011. Educators who just recently submitted portfolio items (in February, April and May 2012) will be added if their total portfolio scores successfully meet established criteria after all scoring has been completed. For more information about eMINTS certification see: http://www.emints.org/inside-emints/portfolio/ Educators from other states may also complete portfolios for eMINTS certification; however, they are not listed on the Missouri Department of Elementary and Secondary Education site. The eMINTS Natio nal Center maintains a database of all (in-state and other states) certified eMINTS educators. * Going Mobile K-12: Capturing the power of Smartphones, tablets, apps and more! The above xkcd comic expresses a common sentiment. Adults sometimes look back at things they learned (and forgot) in school that they have never had to use since graduation. There’s almost a pride that goes along with forgetting everything one learned in school. I don’t know whether this is tied into anti-elitism or a sense of self-sufficiency, but we are proud that we forget how to do math (among other things) as adults. A comic like the one above should remind us just how important it is to make the work and learning students do in our classrooms as authentic as possible. We have to find ways in which to relate curricula so that students either won’t want to forget what is learned in class. 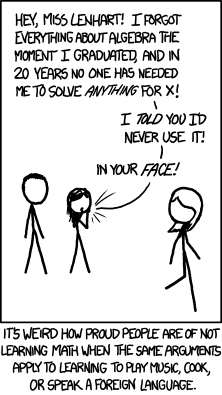 Making content authentic does not guarantee better retention, but it will at least make the learning more meaningful and even more memorable than algebra was for the women in the xkcd comic. Here is my daily problem….I can be working away on something, like a blog post, then an email notification pops up and I think I have to reply. Then my phone beeps at me and it’s a colleague who wants me to look something up for her on the web cause she”s heading to a training session and needs the link for the session opener and can I please send her the link. When I finally put the phone down I get distracted by the website she wanted me to visit. Ten minutes later find myself lost on YouTube not knowing how I got there and completely forgetting my original task at hand so I do a quick check of my Gmail and maybe Facebook. By the time I remember, the blog post is supposed to be done, and then I have to rush to get something, anything written so I can post it on time. AHHHHHH, what a downward spiral I find myself in day after day. Between work and my personal life I am online and connected what feels like every minute of every day. While being “plugged in” and available all the time is great it is not always helpful for my productivity and can be very distracting (see above). Rasmussen College has compiled research from The National Academy of Science and Carnegie Mellon University and displayed it as an infographic. The research shows that the time using media and also trying to multitask has steadily gone up over the past 10 years and that while we might think it makes us more productive it actually leads to stress, inhibition of creativity, inability to solve problems, and slows thinking. Your Brain at Work, a book by David Rock, explains how the brain works and why doing things like I try to do only hurts my effectiveness in the end. He does this in easy to understand vignettes focused around examples very similar to those we all face. The sub-title Strategies for overcoming distraction, regaining focus, and working smarter all day long explains how it is helping me to understand how to work more effectively on a daily basis. And really…who doesn’t want to work smarter. Rock explains that the brain is like a stage and how it takes a lot of energy to keep the show running on that stage. He equates a person’s mindfulness as the director and how much work it is to be the director having to stay highly conscious to what’s going on at all times. In my quest to become less distracted, more focused, and more productive I am learning some new strategies to learn to direct my brain and work smarter. Here are some things I am trying to stay mindful of. Prioritize the “To Do” List – As I mentioned, Rock suggests thinking of my brain as a stage and you want to get the most important actors (tasks) up first. He says that you need to work on the most important (not the easiest) tasks first since they need casino online the most energy and focus. He is also a big believer in writing things down so that your brain can let go of some information. I start my day now with creating my prioritized to-do list on paper. Then I move on to the task as they are “scheduled”. Turn off the Distractions – When working on a difficult task I remove distractions before they take over. This means that I may turn off my phone, close out of email, close my office door, and sometimes I even remove myself from my computer totally. I know that the brain gets distracted easily, so I consciously make the decision to remove the distractions that get my brain off task. Reduce Multitasking – When I find I’m trying to do two things at once I remind myself that my brain can only truly focus on one thing at a time well. To be most effective I need to slow down and continue both tasks knowing I will lose some accuracy and performance or I have to stop one task and focus on the other. Then finish the second task. Consider Multitasking – If I have to multitask I try to pair a thinking task with a task that is more automatic. Research has shown that the brain can do more than one thing at a time with precision if one of the tasks is embedded and doesn’t take thinking to complete. With just these few strategies I have started to feel more effective in what I do and guess what…I am only 1/3 of the way through the book. I hope to learn more about my brain and how I can increase my mindfulness in my journey to working smarter and hopefully I can pass on some additional strategies to you. Have you read Your Brain at Work or other books that have increased your effectiveness and helped you harness your distractions? What tips and strategies would you pass on to help others with these same challenges? Brooke Higgins is an instructional specialist with the eMINTS National Center. You can read this and more at her blog Higgins Helpful Hints Blog. Successful eMINTS Conference: Congratulations to eMINTS staff and presenters at the annual eMINTS Conference in Columbia, MO this past week. The sessions were outstanding and provided attendees with excellent teaching tips and opportunities to share what works with technology and teaching. Watch for podcasts and other resources that will be shared out via the eMINTS website and blog. Every winter, the eMINTS National Center hosts a conference for educational technology practitioners and eMINTS teachers to get together and share resources, methods, and loads of great technology. The conference is part of our professional development program, but many other educators and alumni love to come back for inspiration and energy to carry them through the winter months. Typically, we post updates from the conference on another blog space, but this year we’re moving the operation here to Networked Teaching and Learning. I’ll do a couple of pre-conference posts here and there, but full updates should start on Wednesday. You may also want to follow me on Twitter and the hashtag #eC12. Conference sessions begin Wednesday with some pre-conference workshops. Thursday and Friday are the main days for the conference with keynote speakers set to open each day. Thursday’s keynote is delivered by Dr. Todd Whitaker where he’ll discuss “What Great Teachers Do Differently”. Friday’s keynote speaker is our old friend Bernie Dodge. Bernie will present on “The Power of Student-Made Questions”. Even if you missed your chance to register for this year’s conference, you can follow the action here or on Twitter as mentioned above. It should a be a fun few days of some great educational discussions. New Federal Report on Online Learning Available: The US Department of Education released a report called “Understanding the Implications of Online Learning for Educational Productivity” this past January at: http://www2.ed.gov/about/offices/list/os/technology/implications-online-learning.pdf The report provides foundational knowledge needed to understand how online learning can contribute to educational productivity. It has sections on cost-analysis of using online learning (how to estimate program costs and measure program outcomes) to help reduce costs and make education more efficient, particularly at the high school level. Archived Webinar – Flipped Classroom: Several list members have asked if there is a recording of the webinar from NROC (National Repository of Online Courses) about how to “flip” the classroom using digital media content. eMINTS staff member, Cathie Loesing, was featured on a panel as part of the webinar. The recording link has just been posted at: http://www.nrocnetwork.org/flipping-classroom-digital-media-content – scroll down to Webinar URL. These sites are about Saint Bernards, a large breed of working dogs. Find out how much they eat, how much they weigh, and if they make good household pets. Learn more about the history of these dogs, including their role as rescue dogs in the Swiss Alps. There are photographs, illustrations, and a video. These sites are about the amphibians and reptiles that live in Utah. Also learn about the similarities and differences between amphibians and reptiles. There are links to eThemes Resources on vertebrates and invertebrates and gila monsters. These sites feature math problems of the week for middle and high school students. Includes a link to eThemes Resource: Math: Word Problems. These site are about the symbols of the state of Missouri. Find out information and interactive, games, videos and printables for the many Missouri state symbols. Links to eThemes Resources: Missouri: Facts, Missouri: Native Trees,and Missouri: State Flag. These sites are about paper. Learn about the history of paper, paper making processes, facts and statistics about paper, and its impacts on environments and the economy. Includes a video, quizzes, games, hands-on activities and experiments. There are also links to eThemes Resources on recycling and trees. These sites focus on the lives of Southern Belle before and during the Civil War. There are memoirs reflecting the lives and perspectives of women of a plantation society before and after the Civil War as well as biographies of well-known Southern Belles. Find out roles that they were expected from the society. Includes an eThemes Resources on Civil War: Women. These sites provide ideas for SMART Response classroom usage as well as technical resources. Learn how to set up the system and how to create an assessment for use with the SMART Response System. Includes tutorials, question sets, and question templates. There are also links to eThemes Resources on Teaching Tips: SMART Board Resources and Math: Smart Board Activities. These sites about the Tuskegee Airmen. Learn about the service of the Tuskegee Airmen, African American pilots, during World War II. There is information on the history, training program, combats, and a list of graduates from the institute. Includes primary documents, photos, and classroom activities. There are also links to eThemes Resources on World War II for Upper Grades and Military Aircraft. Learn about realistic fiction, a genre of writing that has situations that could occur in real life. These sites include lists of books that fit into this category and a list of realistic fiction authors. There are also writing prompts to help students write their own realistic fiction stories. Includes links to eThemes Resources on various realistic fiction books. We trust that you had a restful and reflective Martin Luther King Day. Since it was a holiday, there was no post yesterday, but today you will get two posts! For those looking for Martin Luther King materials, check out roughly 200,000 of Dr. King’s writings at the King Center website and archive. Hurry! Sessions are filling fast. February 3, 2012 is the deadline for all conference registrations. For complete conference information, visit http://www.emints.org/conference-2012/conference-schedule/. For questions or registration assistance, please contact the eMINTS National Center office at register@emints.org or (573) 884-7202.